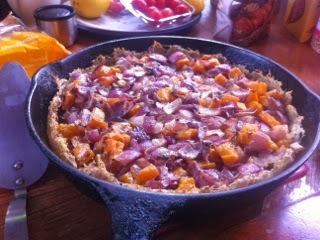 My friend Judy tried out this flourless variation on the Pumpkin and Blue Cheese Freeform Pie. So, I thought I’d let you know about our attempt. We made something a little different. 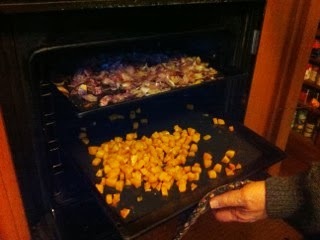 The pie itself was cubes of pumpkin, roasted, and bits of red onion, roasted. 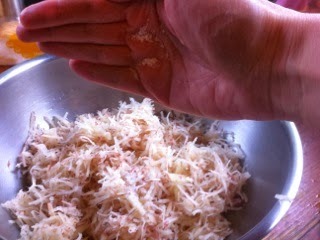 and mixed through (with hands). 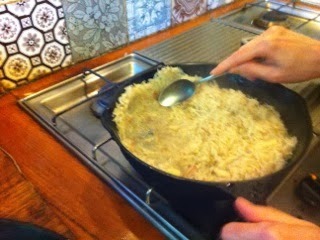 then cooked in the oven until brown and crisp. 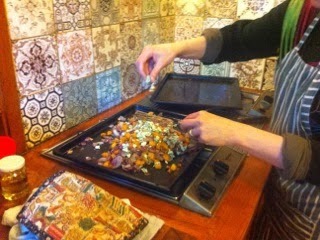 Then add the filling and bake! The verdict: yummy! But... the crust didn’t work. 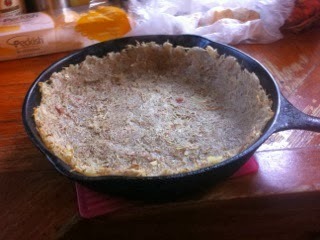 Hash brown crust completely collapsed (the sidey-bits) when scooped out of the skillet. Sigh. Need quite possibly to pre-cook it longer, both on the stovetop and in the oven. But it was so yummy we’ll be giving it another shot. Thanks so much for the idea!! Pictures don't seem to have made it! Yep, all fixed now, sorry!